Definition - 'Executive Decision' - a decision made by one individual that is in the best interest of an individual or group. Anyone for the mixed grill? Ben peruses the menu atop Col de la Madeleine. Stage 12 of this year's Tour de France has been described by Chris Froome as the biggest challenge for the riders, and Mark Cavendish has been quoted as saying he was 'genuinely scared' of the stage, with it being one of the hardest he's seen in his entire professional career - soft lad. At the previous evening's meal, numerous worried Le Loop riders were viewing the parcours of stage 12 in abject horror. Several were carrying injuries, struggling with exhaustion or were just overawed by the severity and distance of the stage. On the previous day we had completed around 115km, which had taken the majority of us around 7.5 - 8hrs 'ride time'. With an additional 20km being added to the already long 175.5km stage 12, there was serious concern that we would either not finish in daylight or perhaps not finish at all. An executive decision was made. The first 50km to the feed was honestly quite dull. Yes, the initial 17km descent was good but there was a lot of traffic and roadworks which really negated any outrageous fun. The rest of the 33km was again on main roads/dual carriageways festooned by carbon monoxide spluttering vehicles and intimately passing juggernauts. Once everyone had fed, watered and set off we helped to pack down the feed stop and headed up to the top of the Madeleine in a team bus - much more civilised. Even driving 25km up an Alpine pass takes an age so I afforded myself 30mins beauty sleep. Once at the top, we set up the feed stop for our soon to arrive comrades and then rolled off down the steep and intimidating Col de la Madeleine descent. Now into my third day of sitting on an unfamiliar saddle, I was sporting two magnificent and uncomfortable saddle sores. Uphill and downhill sitting, each crippled me in differing ways - perhaps it was my body's way of keeping me awake? No amount of creams or painkillers were really helping - again I found a certain amount of solace in swearing; just my way of getting through the day. After more sticky tarmac and glued gravel on the tyres, we approached the punchy Lacets de Montvernier - 3.4km @ 8.2%. The Lacets has been described as possibly the most beautiful road in cycling history. Now, I agree, from above in a helicopter or on a TV screen while sitting on a couch it looks stunning. Hairpin after glorious hairpin, like a grey ribbon has been dropped and is gently caressing the side of the mountain. However, from a rider's point of view, or should I say a chubby rider's point of view, it was just another tough, hot, steep climb. Secretly, however, I really enjoyed this - but I didn't want to let on to my legs until they'd got me over the top. High emotions and bad altitude: impressions from Stage 12. After a small amount of descending into Saint Jean de Maurienne and then lunch, thoughts turned to the next HC climb - Col de la Croix de Fer. Now we had been told that the Croix de Fer was a 25km climb - wrong, wrong, wrong, wrong, wrong! It's actually 29km; I mean come on, give me a break, how on earth can you go up for 29km and not be in space!??! This Col also lies, and it lies even more blatantly than those ruddy km markers. It has no qualms about making you ride uphill 1km at 9.8% only to then make you go downhill at a similar if not steeper gradient, knowing full well you're going to have to re-climb that distance and gradient later on; I mean, what's the ruddy point!? I think it was somewhere between km 7-11 with gradients above 11% that I cracked. The heat was touching 30 degrees and it was airless. I had a little sit by the side of the road and considered my existence on this mortal coil. If I had not sweated out most of the salty moisture in my body I might have had a little cry. There were three options: carry on, turn around and admit defeat to be swept up by the broom wagon, or wait here, eventually succumbing to exposure and have my body picked off by the local carnivores. 'Give yer head a shek lad!' as my Yorkshire uncle would say. Get on that bike and get up that mountain. So I did. Somewhere around the 18-19km mark with the gradient easing somewhat came a familiar cry from up the road. "Come on guys! I have Coke!" Throughout the ride a Finnish cyclist had given us our daily race tactics and motivation, which were the same every morning - "Ride hard guys, full gas, attack, attack!" His accent and demeanour were not unlike Brian Holm, the former HTC Highroad Directeur Sportif who marshalled Mark Cavendish's HTC leadout train of the noughties. Anyway, our Finnish saviour was up the road like a beautiful Nordic mirage, holding four bottles of ice-cold full fat Coke. I could have kissed him, I think I probably did! After a little rest and some generally motivational speaking we continued. We had come out of the valley now and the air was fresher and cooler. The views were wonderful again and life was better. The last 6km of the climb, things got steeper, sheer and a bit head-windy. Looking down over the edge and getting buffeted around by the gusts near the top was slightly terrifying, but with my large ballast I was unlikely to get blown off the road and decided to concentrate on looking up to the finish instead of the 2000m plus drop below. Finally, I reached the top, up there it was cold and blustery. I knew I probably shouldn't hang around for too long, but my body was aching from the past 4hrs of torture and I needed a sit. With my stomach becoming more petulant about the intake of gels and energy style s'mores, I vouched for something a bit closer to home - cheese and crackers. I probably ate too many, but they tasted like nectar and it afforded my backside more time to recover from the bruising and chaffing from the saddle. 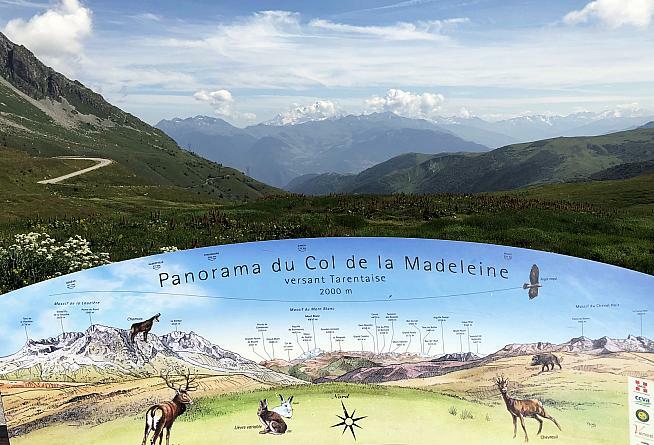 Finally, after eating half my bodyweight in the local area's finest cheese, I was ready to descend; after paying my respects to the climb, I started my journey to the final challenge of my French Odyssey - Alpe d'Huez. Don't tell Ben but next year we're sending him to ride this on a BMX. This time it was the turn of the 40km descent to lie. There were several uphill parts during the downhill, and not just the 'use your momentum and pedal a bit to get over' uphill kicker parts. There were 1-2km @ 12% uphill parts. But dropping right down onto the valley floor was stunning and this had to be one of the most idyllic and best sections of the three days. The Neolithic mountainsides, some still covered in deep snow pack, the Grand Maison lake and the absence of any sign of modern society made for a prehistoric feel to the area and I could have sworn I saw some sort of ice troll or yeti coming out of a well-hewn ice cave - too much cheese probably. And then there was one last hill...Alpe d'Huez. Marco Pantani holds the record for the 21 hairpin climb at 37m 35secs, but it would be fair to say he'd probably had a few 'pot belge' espressos that day. It was 7pm by the time I was ready to set off - 13.8km @ 8.1%. Some rudimentary calculations established that if I could maintain a steady 7km/h I would be up and in the bar by 9pm - allez, allez, on y va! It was my first time riding Alpe d'Huez. Most of the main part of the climb is above 9%, with a sticky bit in the middle which ramps up above 11.5% before the final run for home which settles to 5.5% for 3km. It was around the 10km mark that I did start to struggle. I was getting cramp and all positions in the saddle were eye-wateringly painful. As my bottles were empty, I stopped by a natural waterfall by the side of the road. I'd been advised earlier that it was safe to drink from fast flowing waterfalls, so reached in and filled my bidons. The water was ice cold and refreshing. I suddenly felt exhilarated and focused - a oneness. Was it a connection with the mountain? A spiritual symbiosis whereby the mountain was giving me sustenance and vitality to reach my ultimate goal and fully understand her metaphysical beauty and view the majesty of the natural world from the summit? Or was it just the cheese again? Through the village of Alpe d'Huez I clicked my gearing up into the big blade and powered home. I'd done it, all three of this year's Tour de France alpine stages done. On the outside I looked like a bag of smashed crabs, but inside I was untouched and glowing with pride. I massively enjoyed my time with Le Loop and would like to wholeheartedly thank all the staff involved; especially Sarah and Kate, without whose help none of this would have happened. I can't wait to see the pros tackle these stages and have got back home and recovered just in time to fully recover! Vive le Tour; Vive 'Le Loop'! 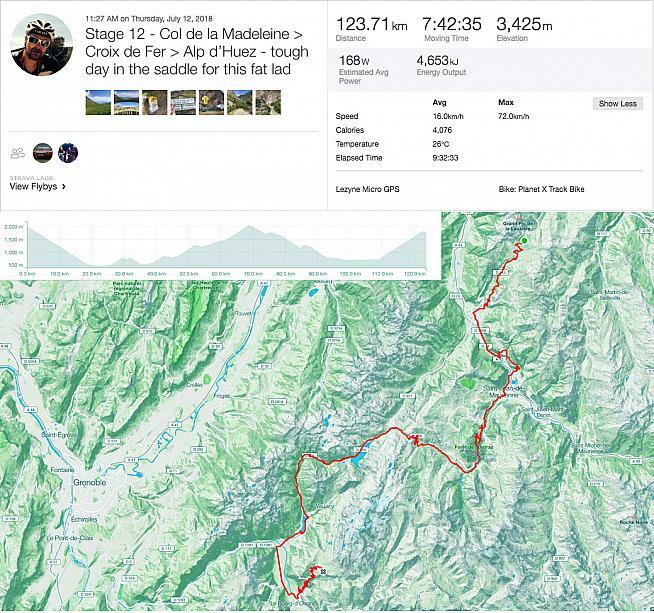 Ben rode three stages of the 2018 Tour de France with Le Loop. For more information visit rideleloop.org.